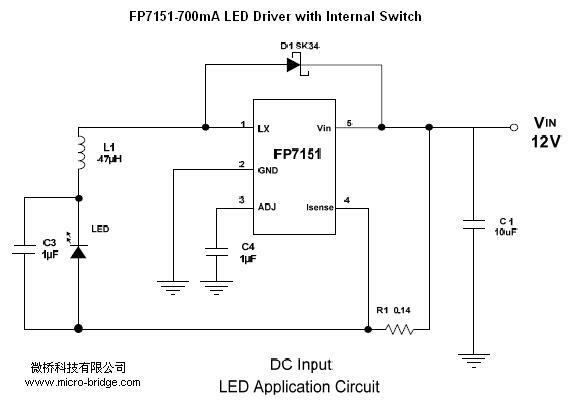 The FP7151 is a continuous mode inductive step down converter. It can driving single or multiple series connected LEDs. The FP7151 includes the output switch and a high-side output current sensing circuit, which use an external resistor to set the average output current. Output current can also be adjusted by applying an external signal to the ˉADJˇ pin. The ADJ pin will accept either a DC voltage or a PWM waveform. The PWM filter components are contained within the chip. Applying a voltage under 0.2V to the ADJ pin will turn off the output. The FP7151 is available in the SOT23-5L package and provides space-saving PCB for the application fields.